Home Costs > How Much Does Decomposed Granite Cost? How Much Does Decomposed Granite Cost? Decomposed granite is a type of granite rock that has aged and is then fractured into smaller pieces or small chunks of weak rock. Decomposed granite, in its crushed form, is often used for pavement and building material, but unlike granite, don’t confuse the two, because the two won’t be the same material since decomposed granite tends to have sharper edges and shapes. This material is often used for driveways, gardens, trails and urban parks. The price of decomposed granite depends on the quality of the rock, the amount of rock that will be purchased and the company selling it. On average, decomposed granite, one inch in depth, can cost anywhere from $1 to $3.50 per square foot or about $3 to $6 per cubic yard. These prices, most of the time, should include the delivery and distribution, but it won’t include the installation price. Usually, the most common and affordable type of decomposed granite comes in a gray color; however, it can come in close to 30 other color shades. If you were to hire professionals, the costs of the job would greatly depend on what needs to be done. Most of the time, professional landscapers will charge anywhere from $55 to $80 per hour to lay decomposed granite for you, so to budget properly, plan on either paying by the hour or spending at least $4 to $7 per square foot for something such as a walkway or driveway if the contractor chooses to quote by the square footage. According to HomeAdvisor.com, the average 400 square foot driveway would cost about $100 to $300 for the materials alone; however, the website notes this material isn’t recommended for those who live in an area prone to a lot of rain since it can be washed away. Natural decomposed granite will often be used for mulch around plants and trees as it provides essential nutrients to the soil and lasts much longer than mulch. Stabilized decomposed granite will often be added on top of another type of gravel and then be added again a loose layer. A resin will resemble asphalt but will have a look that’s more natural. If you need to have it delivered, most landscaping services will charge about $50 to $75, depending on how far they have to travel. Laying down landscaping fabric underneath the decomposed granite, if being used for a pathway, is recommended so weeds and grass don’t come up. If you’re going to do it on your own, you will need the following type of equipment: a soil compactor, wheelbarrow, shovels and rakes. This type of granite will pack well, allowing less water to drain through its system. This granite is ideal for walkways, as mulch, or even a paver walk. Common uses for decomposed granite includes a walkway, driveway, ground cover, mulching material, a makeshift patio, as a weed controller or as an underlayment for a fire pit. Installing this granite too close to the home may cause it to stick to shoes, which in turn, can scratch floors. 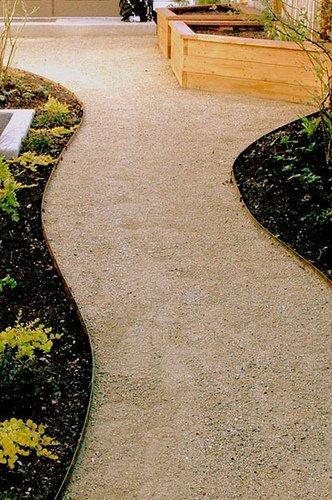 When compared to other material for walkways, it can often be one of the more inexpensive options. Regardless of what you’re using it for, it will require very little maintenance, with the exception of filling bare spots that may have washed away. Weeds will be kept to a minimum when compared to other areas such as grass and mulch. As noted earlier, it comes in a variety of colors, offering you a lot of choices to match the aesthetics of your home. Due to the sharp edges on the stone, it won’t be possible to walk barefoot on the path. Because the stone tends to be loose, it can naturally move over time due to wind and rain. If it’s installed close to the home, it can be tracked inside the home, ultimately causing damage to wood flooring because of the sharp edges being able to scratch the surface. As cars drive over the surface, it can leave indentation marks that need to be raked time and time again. I think you guys mean cubic yard where you said square foot.